The black-necked stilt is a large shorebird with sharply contrasting black upper parts, white under-parts, and a long, thin, up-curved bill. They have red eyes with white eye-rings, and white patch above. Their legs are extremely long and red-pink. They feed on insects, fish, worms, small crustaceans and seeds. They are found on the margins of shallow inland ponds and lakes in open country. 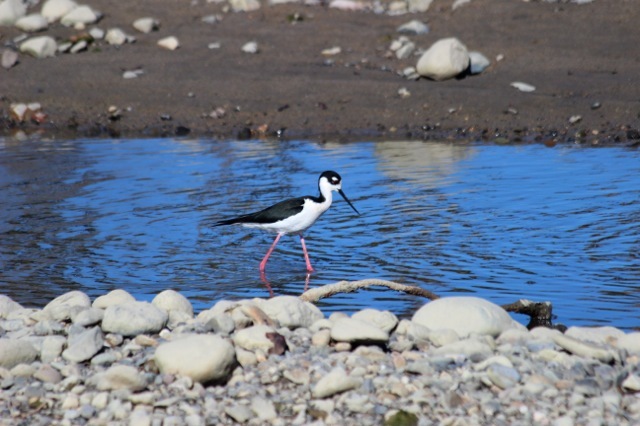 During migration, black-necked stilts may visit coastal mud flats. Photo courtesy of the Jim Serpa Photography Collection.